Ola! The rl fandamily and I have been getting things in order for a camping/fishing trip coming up next week, so I have been in and out most of the time, but I nabbed this photo this afternoon and wanted to get a post out before I must sleep. My Attic at the Deck is open and there are some really wonderful offerings this round. Lacuna has this fabulous Crop Top/Capri Combo out in so many colors to choose from. L.Warwick also has the Eliza Cork Platform Wedges out in many different colors to choose from as well. Everything at My Attic at the Deck is 95L and not to be missed! Good morning, I hope everyone is has had a chance to shop at the 2014 Hair Fair, I am back with some more beautiful locks for you to feast your eyes upon. I am really loving the new styles from Vanity Hair, we go from wildly beautiful (Alien, Flirt & Flirt 2) to a lovely long straight do (Infinity) to a wonderful crimped do So Selfish ( love the name of this style), all styles of course include materials and non-materials versions. sYs has some amazing styles out as well! I fell in love with each immediately, the half inverted bob of Yiu, and the full bob of Lou are fabulous as this is how I wear my hair in rl. Hanayo I totally love Love LOVE, I can see this style being a knockout for a few different types of wear, the wonderful hud that comes with enables you to change the color of the fan and flowers of this style, and the simple but stunning Lio has pulled me into a full photo vision as I just love it this style with the newest Mesh Felicia Outfit from Baiastice, combined with new Severity Treaded Platform Wedges from L.Warwick. Shi although not a new store to me, has this magnificent Poise style with color change Hair Pin, and I just adore the strands that cross over the face. I have never bought hair from Shi so this is my first, but not to be my last 🙂 Every hair fair I discover new stores, which is just one of the perks of having all these wonderful designs to shop from all in one place. Elua and Blues are new to me and are not to be missed. No matter if you’re human, fairy, furry, vampire, bunny or any other kind of avatar, the one thing we all have in common is we all wear hair, it is part of our identity yes? (ok unless you are a bald man with a monocle 😉 But as most of us aren’t, this event is highly regarded in all communities in sl, which is fantastic all on its own how we all come together, but this also means this event will have a certain amount of sever/personal side lag, and of course will be harder to get into for the first few days. There is a fabulous article over on the Hair Fair Blog written by Morgana Hilra from So Hawt SL about what you can do to make your experience even better when visiting the Hair Fair and all events which are high volume. Strip down, wear layers only, no attachments! Also take off all your scripted items, no one there cares you are not wearing your AO or are sporting only your default avatars without your mesh body attachments. Everything can be put back on when you return home with your fabulous new hair yes?! Last of all Morgana gives tips on how to derender everyone there, I do the same but I just use the combination of Shift+Ctrl+Alt+4, this derenders every avatar there as well as your own but not the build or vendors. I consider this to be the most fabulous event to date, but what I have learned in my years here is when you have 50 or so people per sim and thousands trying to get in, we will no doubt have lag to contend with. We are there to shop and by doing so contributing to Wigs for Kids, a fabulous charity that helps children still grow into their own identity at a time in their lives when they need that kind of normalcy while they deal with the unimaginable from sickness. I was so happy to see the additional landing points where you can cam shop or try your luck at bumping yourself into the sim as people leave hehe, yes I have gone this route more times than I can count, and all I can say is for hair and a fabulous charity………I will do anything and go anywhere! Hai! I am back again with more from the 2014 Hair Fair! Exile has certainly Blown me Away with this fabulous wind swept do. Tableau Vivant has a soft selection out, Francois and Lusch are definitely my style. INK has this pretty little updo out…….I love braided hair so much! Ploom is rocking the Updo’s, I think I need to buy more red hair yes? Ola! I am back with some more goodies from the 2014 Hair Fair! 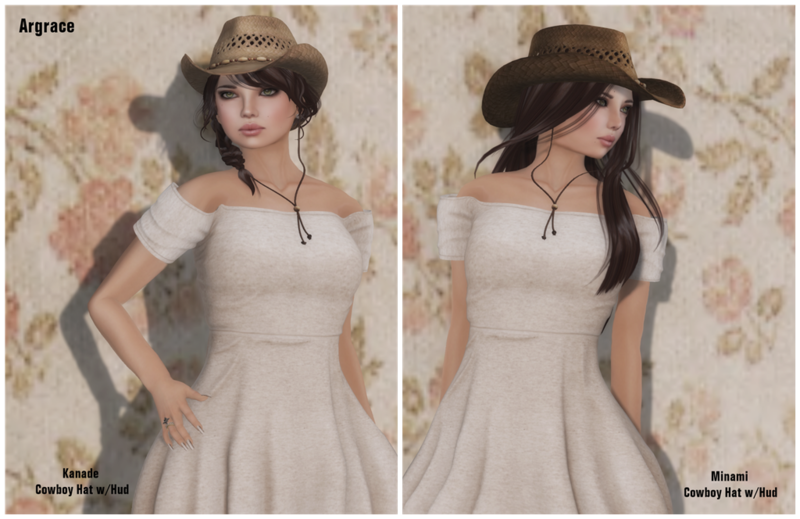 Argrace has the very beautiful Cowboy Hat styles, both the Kanade and Minami styles come with a hud with lots of options…….these are a necessity. Clawtooth has the perfectly pretty mesh Cherry Bomb, A Little Soul and Color Me Pretty, there is a fourth I believe but I still need to go grab it. Angie, Lala and Tajae are all from Iconic, which has this fabulous exclusive to the hair fair only Flexi Icon style and she is yummy. I adore mesh hair but it’s still fun to wear flexi as well! Tameless has some wonderful offerings, Lana, Lilly, Marie and Sybil are just a few pretty hair fair releases, there a few more styles in store as well. Hair: Argrace ~ Kanade Coyboy Hat w/Hud, Minami Coyboy Hat w/Hud. Hi there! Summerfest’14 is open and certainly has some very lovely releases! Belleza has the beautiful Ria in four amazing new makeups! Each skin tone comes with cleavage, mole, freckles, sunburn and four lip gloss layers . I just adore the sunburn layer, Ria is simply perfection as with all Belleza skins. Baiastice has new Bikinis to be had also at Summerfest. The Mesh Freedom Bikini is available in multiple colors and again I am not wearing an alpha because Sissy is just that good with her mesh designs hehe. The Garden at The Liaison Collaborative has this positively fabulous Ava Beach Furniture from MudHoney. you can pick your favorite textures as the Ava Umbrella has five different colors to choose from, as well as the Beach Chair and Ottoman have three separate colors also. I’ve added a few of my favorites to the scene of course. Hai! Fashion for Life is still rocking out until next Friday June 20th, so here is your chance to nab some of the most wonderful exclusive creations on our beloved grid. Today I bring you new LeeZu! This fabulous mesh and materials ready Cora Mini Ruffle Skirt is available in many prints to choose from, but I knew I wanted this design as soon as I walked into LeeZu’s store, if you haven’t been maybe go and hang out like I did lol. LeeZu! has amazing flowers that I could dance around in all day! EMO-tions has the beautiful Josy style out for an exclusive, Eclectica has the super pretty Octopus Necklace out and omg I absolutely love this…….I think I need to go back and nab a few more colors lol! Pomposity ~ a new store to me has some amazing jewels to be had. Oh and this cute little Crepe Fitted Tank Top is made by ! !smesh, another new to me store. I hope everyone has had a chance to visit all the Fashion for Life Sims. The build is fabulous, walking into each sim it is hard not to feel like you are being transported to each different place and time, the very idea of Wanderlust 🙂 Make sure to visit and nab some of the wonderful exclusive items to be had as all proceeds go to The American Cancer Society. Just remember I have the Sim Slurls posted —-> over to the right, as well as all individual store slurls on a page (look up). You only have until this Friday to find your Wanderlust! I will be back soon I promise, I am falling a tad behind……such is (second & real) life lol Have an amazing day and I will……. Back so soon? Yes and with more fabulous Autumn Collection from Baiastice. I am in love the Brit Military Jacket, I just love the style and the textures used…….one of my favorites so you will see this again on me hehe. I am also wearing the new Emy High-waist Trousers and the fabulous new Olympia Bag, which also has a shoulder option and is resizable…….of course all are available in many different colors to choose from.